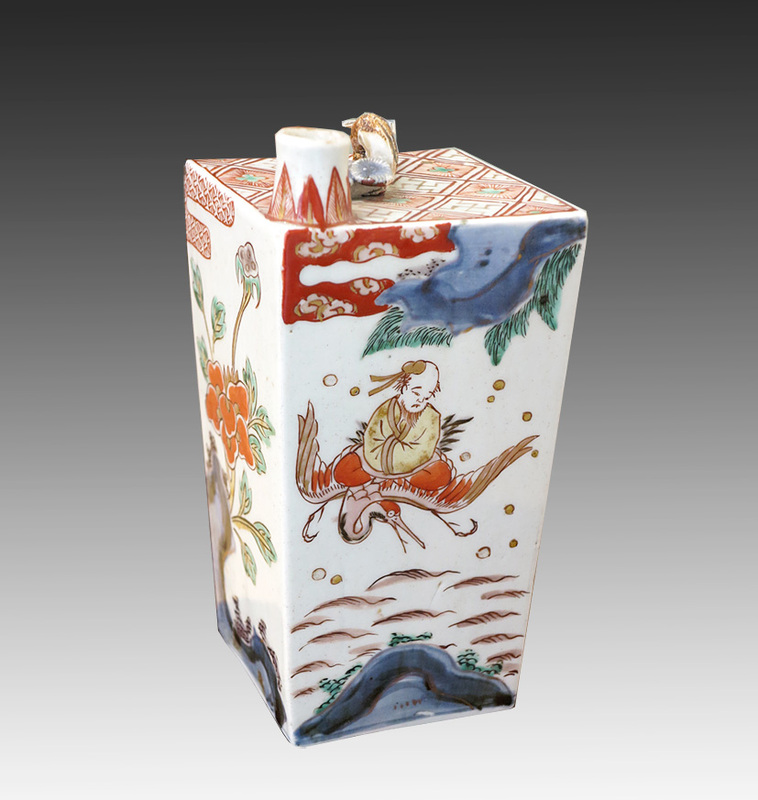 The Goffi Carboni Gallery pays a particular attention to Chinese and Japanese oriental art. 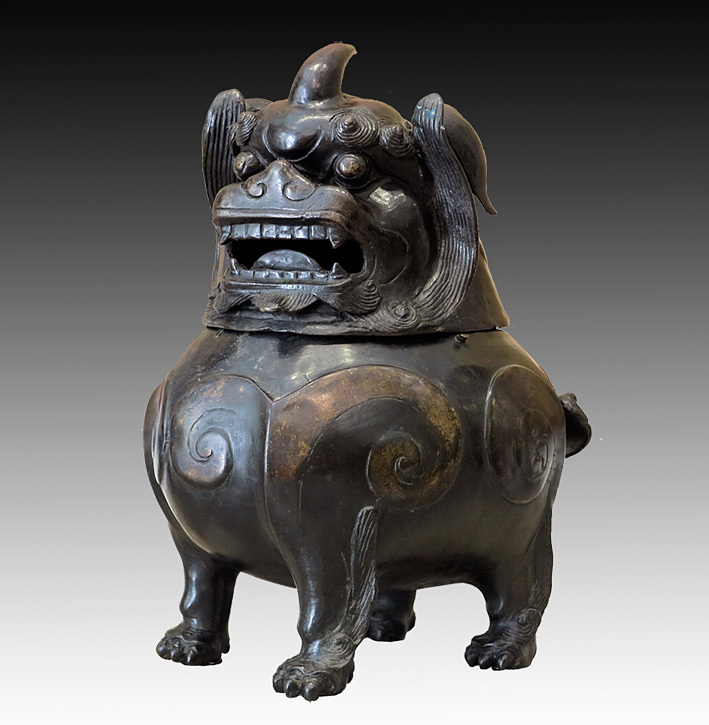 This passion has, from the beginning, led to it being one of the very few galleries in Italy to frequent this specialist international market and its auctions and is one devoted to all the manifestations of oriental decorative art. 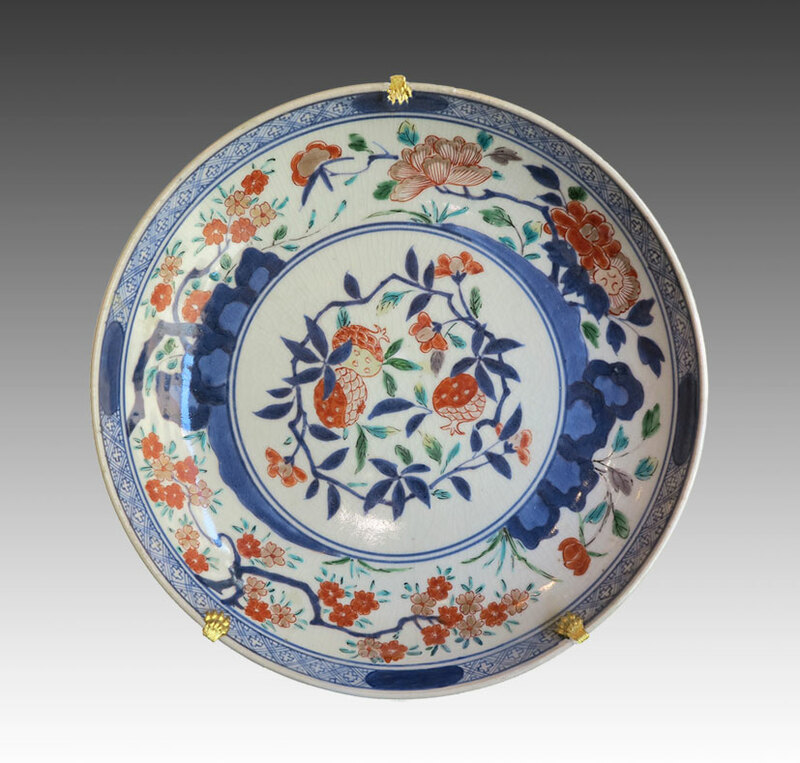 Chinese and Japanese furniture, Chinese porcelain and paintings, ukiyoe, Chinese and Japanese lacquers, bronzes, pieces of ivory, cloisonné and enamels are among its main areas of interest. 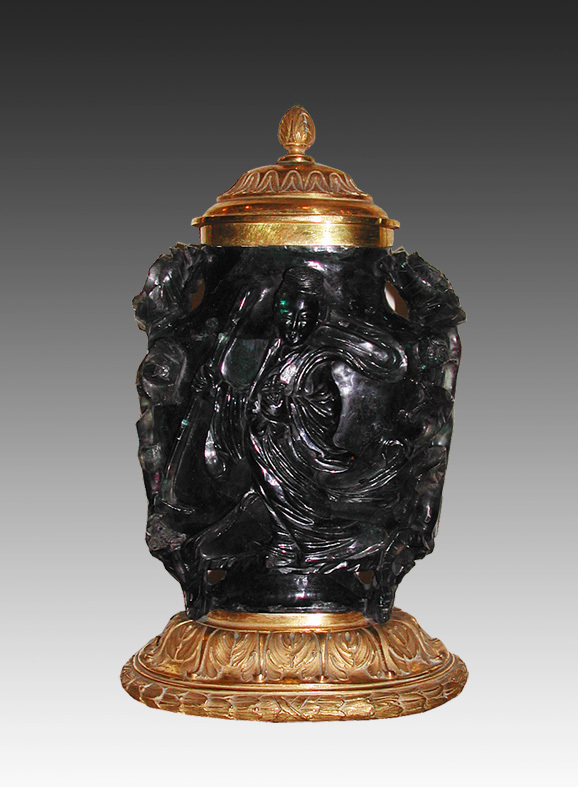 Vaso cinese in fluorite con figure femminili a rilievo. Montatura e coperchio in bronzo dorato francese. Epoca sec. XIX. Provenienza Collezione Manlio Goffi. A bronze Luduan-form censer and cover. 32 cm high. China, 19th century. 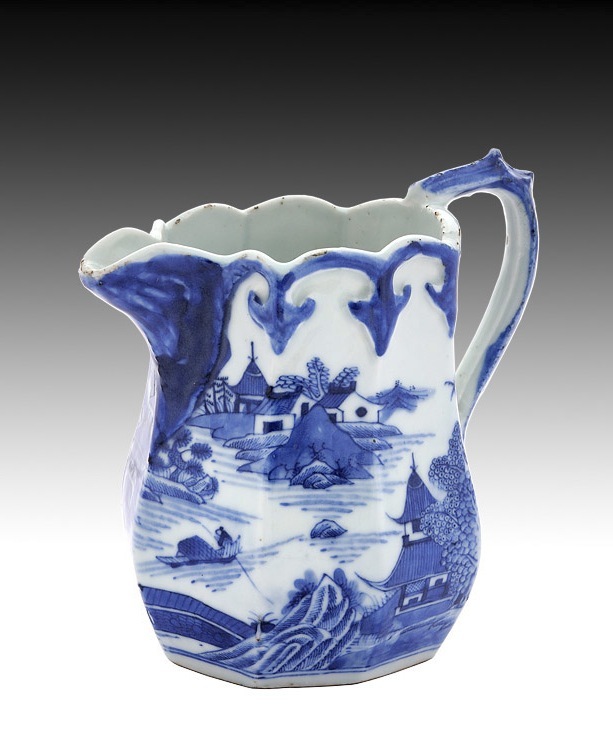 Porcelain vase with white and blue decoration depicting landscapes. From an English model, around 1870. China. Zuppiera con coperchio in porcellana a decoro bianco e blu, raffigurante peonie e fiori di crisantemi, e un piatto ovale con lo stesso decoro. Cina, epoca Qianlong (1736-1796). Diam. zuppiera cm 32, diam. piatto cm. 37. 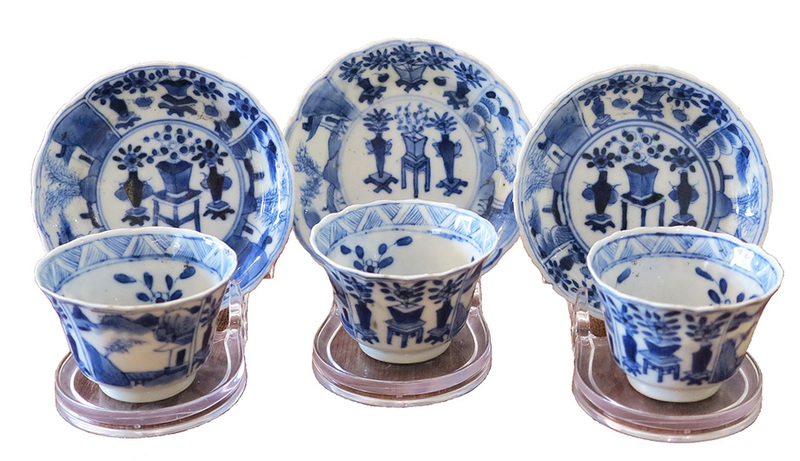 Three porcelain small cups and dishes. China, mark and period Kangxi (1662-1722). 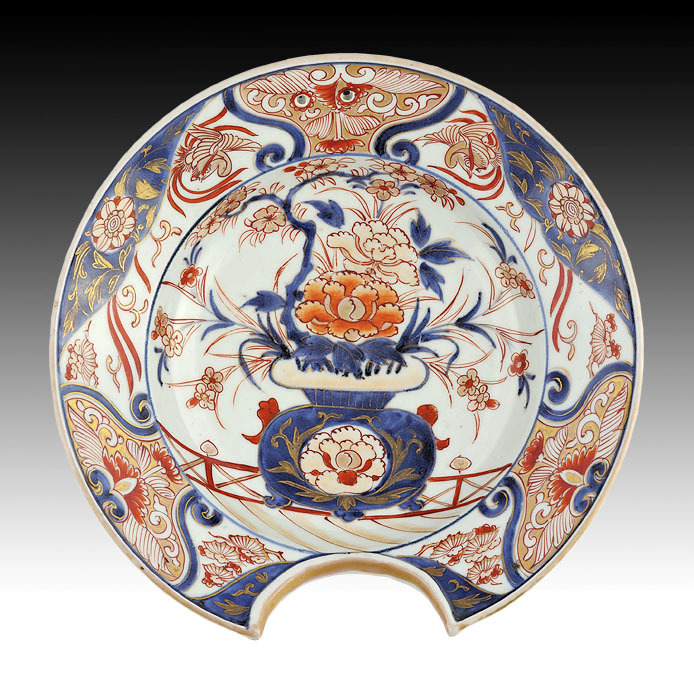 Imari porcelain dish with a chrysanthemum in the center, surrounded by flowering branches. In China the chrysanthemum is an autumn symbol and emblem of happiness and joviality. China, Kangxi (1662-1722). 38.5 cm wide. 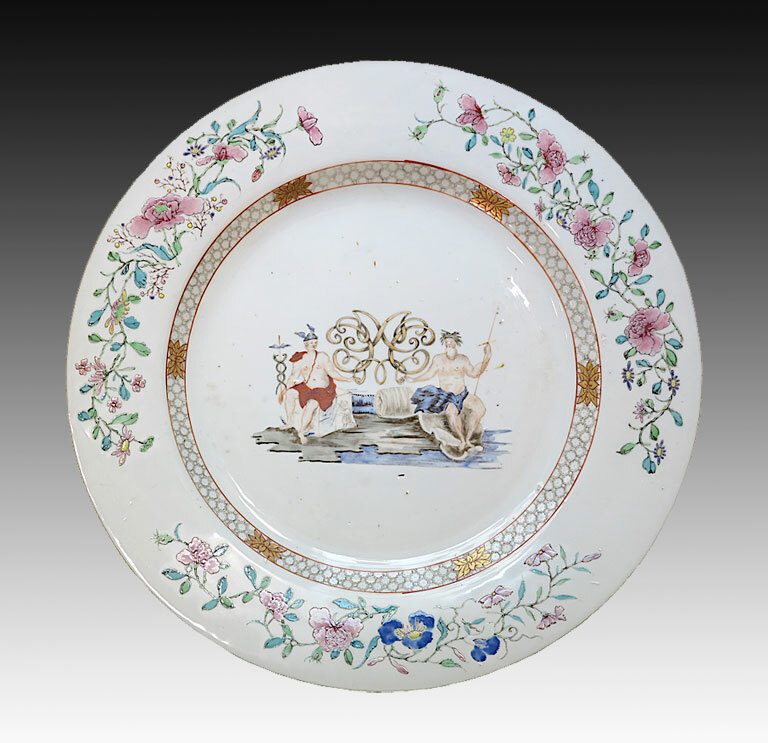 Famille rose mythological dish with Mercury. the winged messenger and Neptune, the god fo the sea. China, Yongzheng period (1722-1735). 31,7 cm wide. 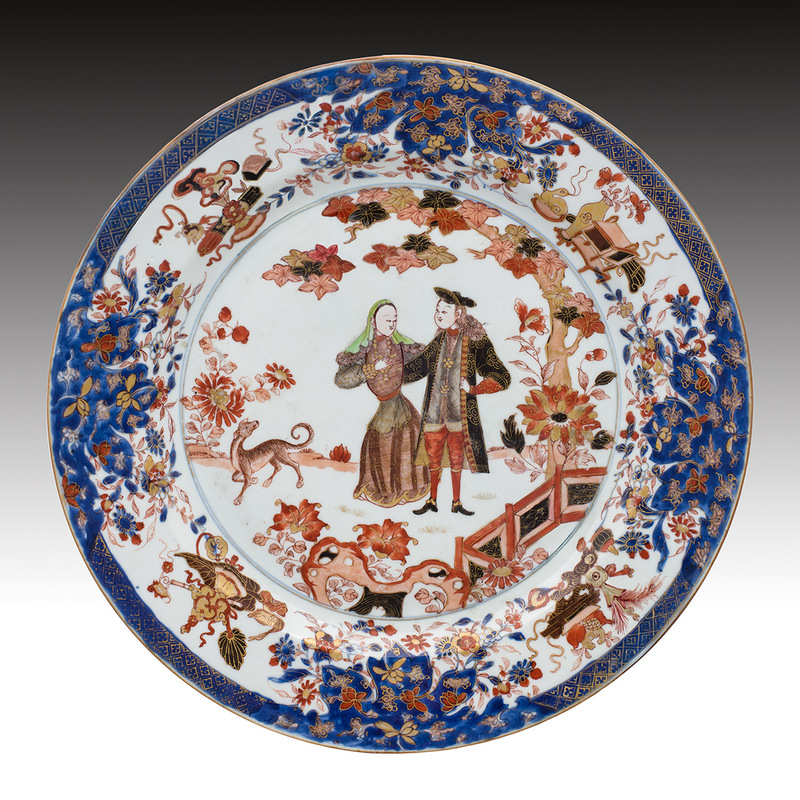 A chinese verte-imari "Governor Duff" plate, China, 1730 ca., 35,5 cm diameter. 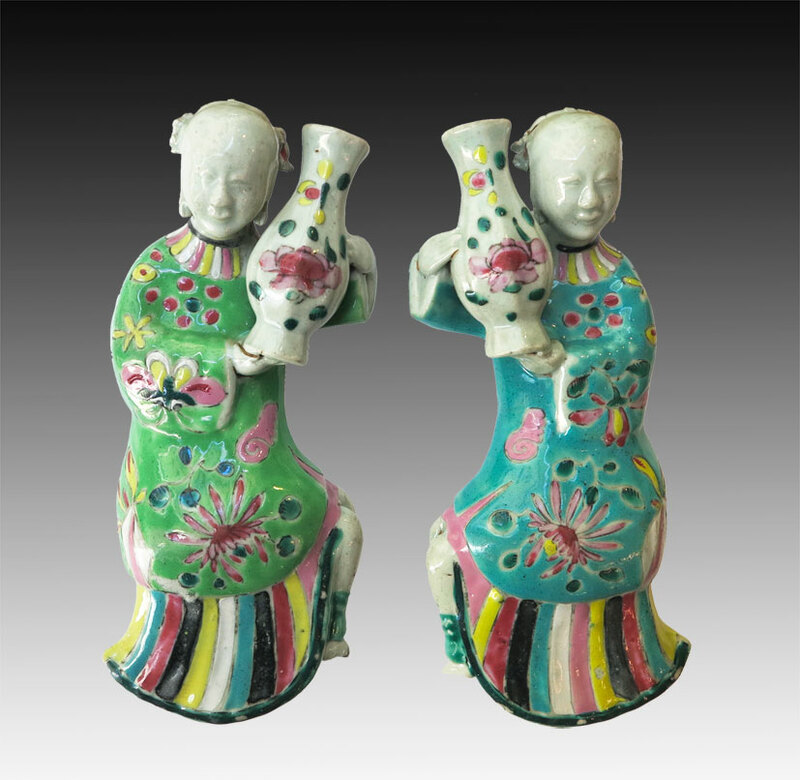 A pair of porcelain "famille rose" wall pocket vases. China, Jiaqing (1796-1820). 20,5 cm. high. Arita polychrome porcelain vase for the sake of a quadrangular shape. On one side of a man with a crane, symbol of long life. Japan, second half of 17th century. 19 cm. high. 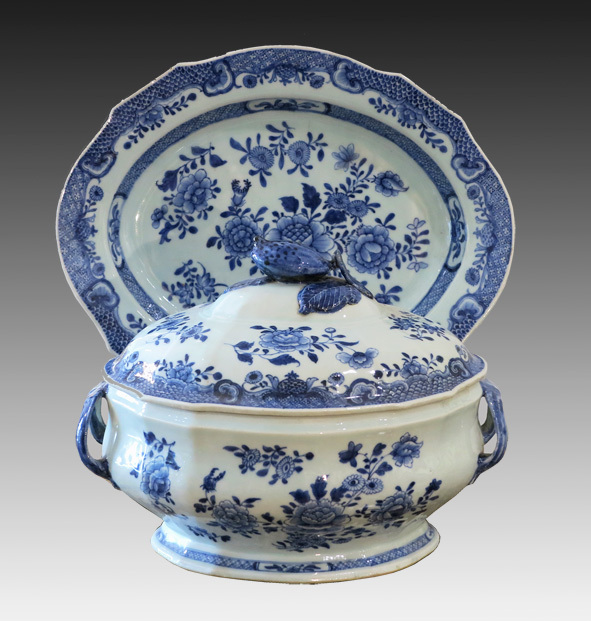 Japanese Imari barber's basin. Edo period (1603-1868), 18th century. 27 cm wide. 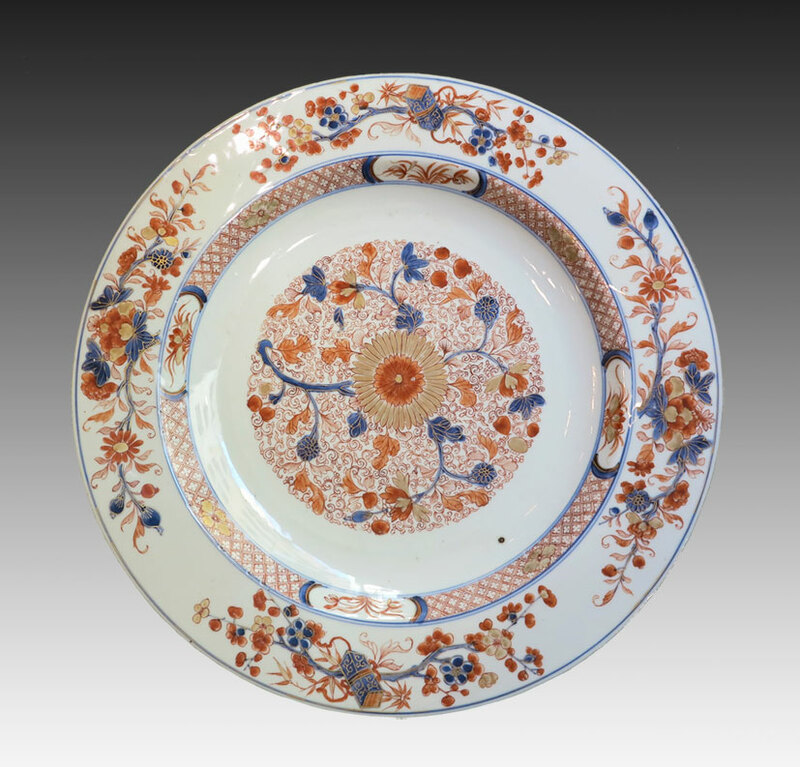 Arita polychrome dish depicting floral motifs with pomegranates in the middle. The pomegranate is a symbol of happiness and abundance. Japan, second half of 17th century. 27,5 cm wide. 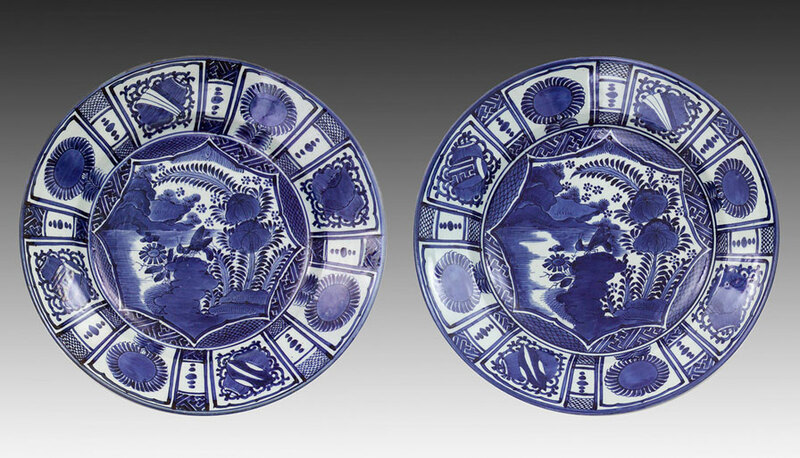 A pair of blue and white kraak dishes, Japan Arita, circa 1700, 42 cm. diam. One chinese-export watercolour on rice paper from a set of six. 17,5 x 29,5 cm. 19th century. From the "The Twenty-four Filial Exemplars". One of two panels painted on paper. China, Kangxi (1662-1722), 154 x 73 cm (154 x 75 cm the second). 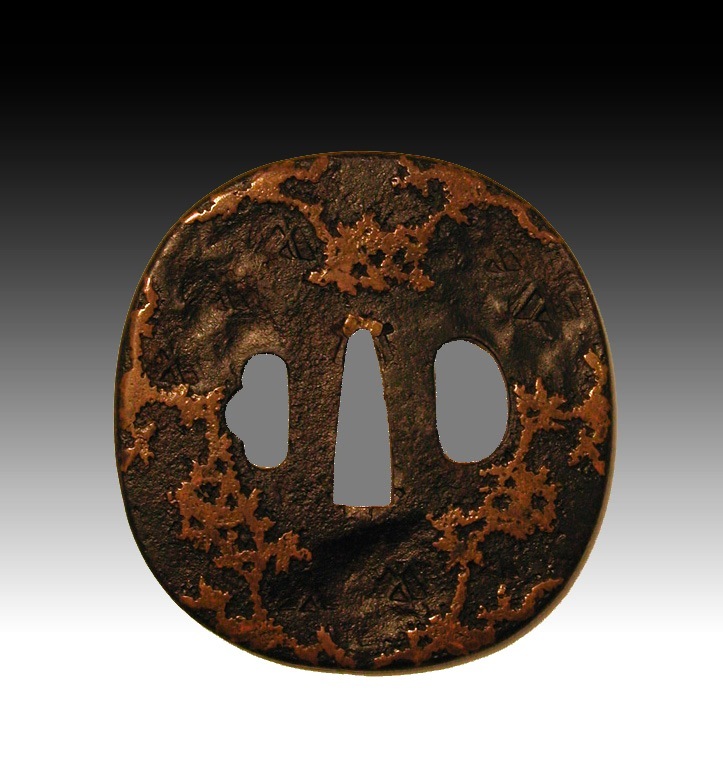 Tsuba, Japan, Edo period, 18th century. H. mm 81. Utagawa Kuniyoshi(1798-1861). 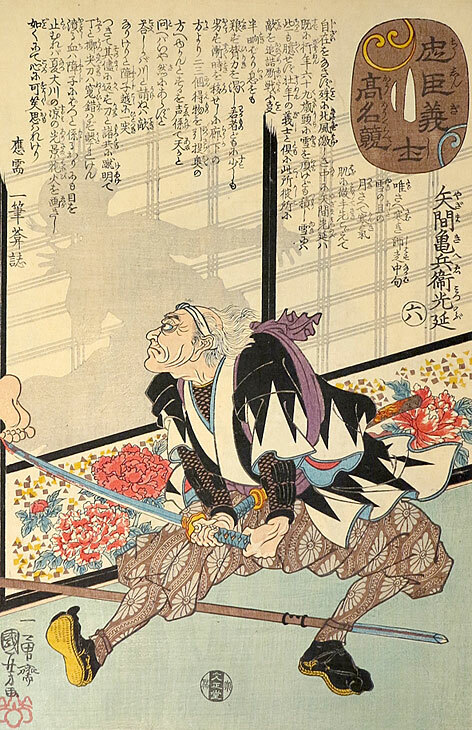 From the series: "Comparison of the High Renown of the Loyal Retainers and Faithful Samurai", "Yukugawa Sampei Munenori with a sword in combat with a foe armed with a pole arm". Woodcut, 1848. Utagawa Kuniyoshi(1798-1861). 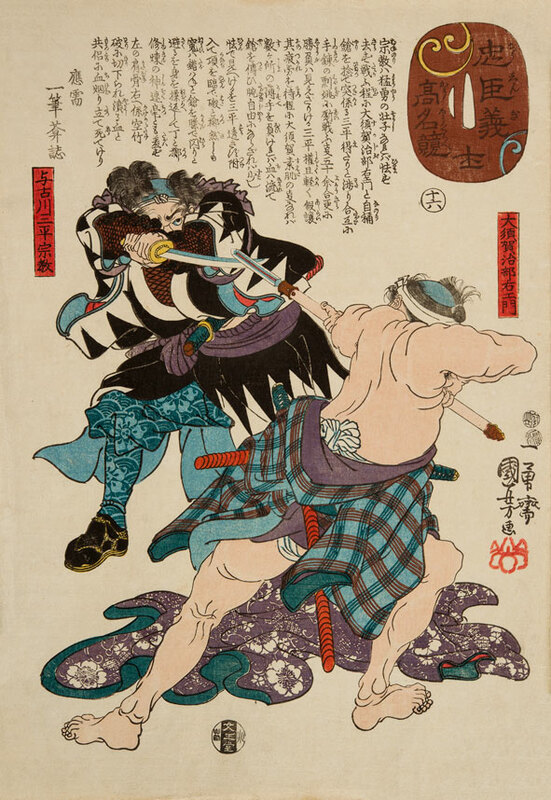 From the series: "Comparison of the High Renown of the Loyal Retainers and Faithful Samurai", "Yazama Kihei Mitsunobu making a sword stroke at a fleeing adversary". Woodcut, 1848. 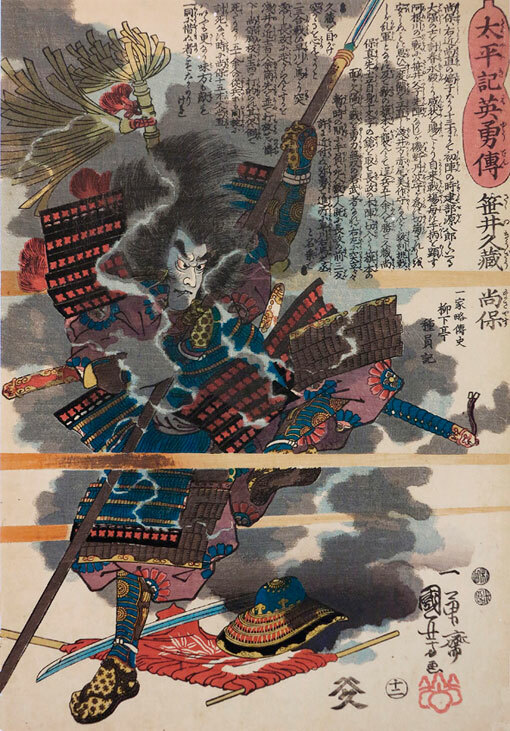 Utagawa Kuniyoshi (1798 - 1861), "Sasai Kyuzo Masayasu" from the series "Heroes of the Great Peace" (Taiheiki eiyu den), n° 12. Woodblok print. Utagawa Kuniyoshi (1797-1861). "Portrait of Lady Yae compared to the peonies". From the series: "E-kyodai mitate sanju bokkasen". Publisher Joshu-ya Kinzo. Woodcut. Date: ca. 1844. 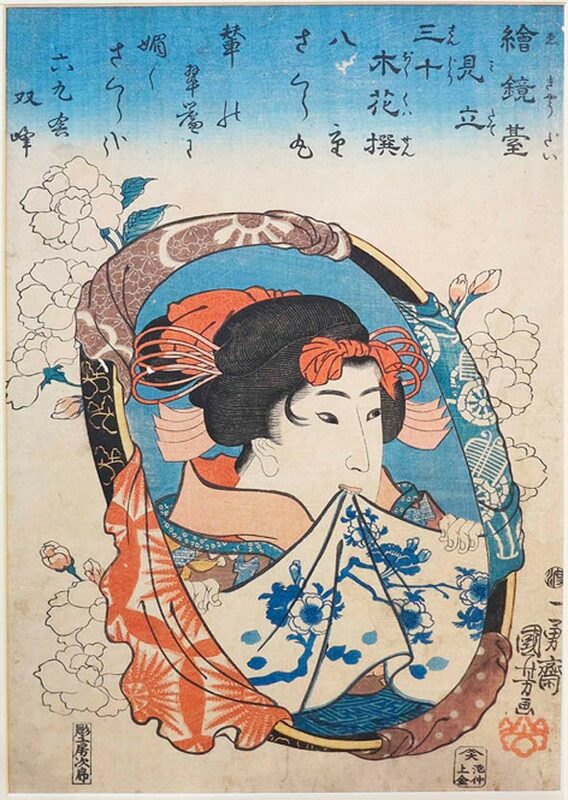 Utagawa Kunisada (1786-1865), from the series "Legends of women of all ages", signed ki-ō Toyokuni ga, censor seal Aratame with date, editore Uoya Eikichi, july 1862, Oban. 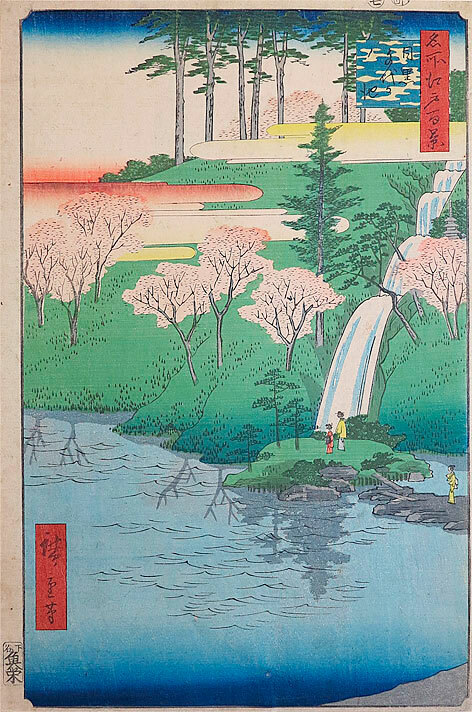 Utagawa Hiroshige (1797-1858) "Ishibe" n°52. 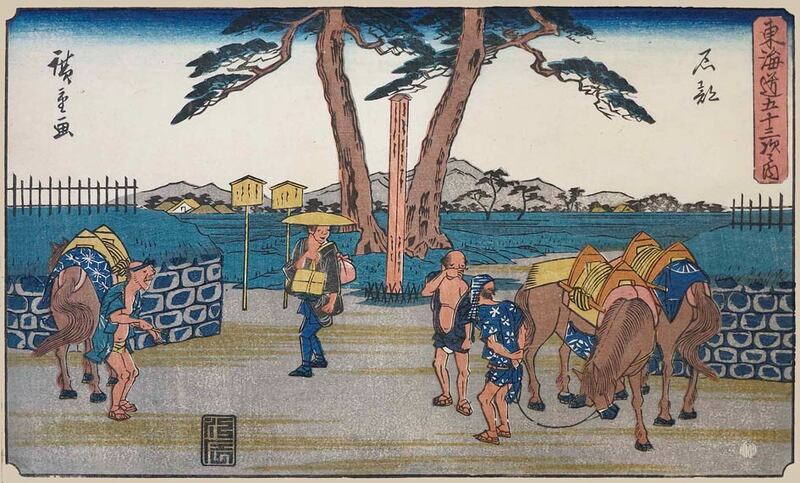 From the series "The Fifty-three Stations of the Tokaido Road" (Gyōsho Tōkaidō). Publisher: Ezakiya Kichibei. Date: 1841-42. Aiban size. 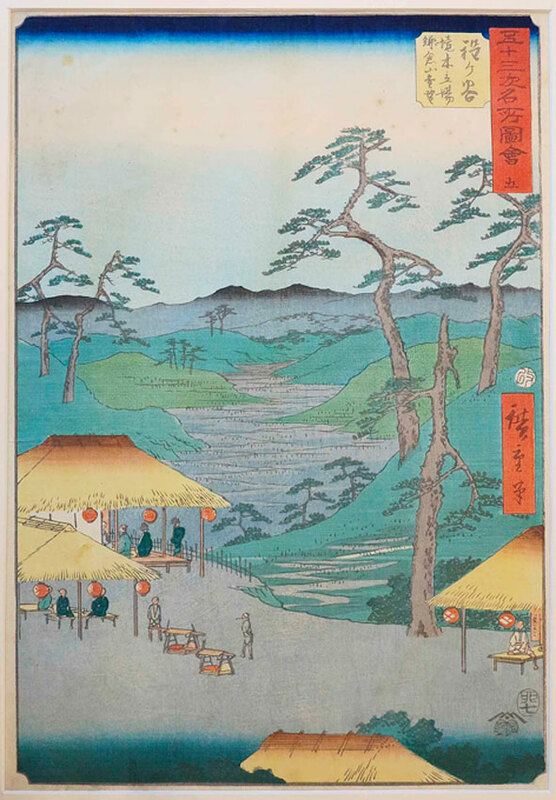 Utagawa Hiroshige (1797-1858), Chiyogaike Pond, Meguro (Meguro Chiyogaike), from the series "One Hundred Famous Views of Edo (Meisho Edo hyakkei)".